Gary Wolstenholme reviews the Sony 18-105mm f/4 Power Zoom G OSS lens for Sony NEX and E-Mount cameras. This 6x zoom lens sports a constant maximum aperture of f/4 throughout the zoom range, a powered zoom system with two separate controls, internal focusing and zoom and optical stabilisation. 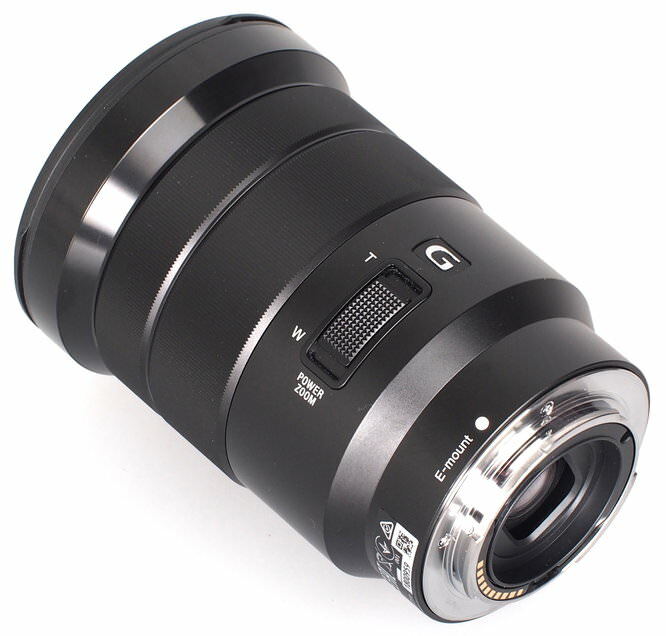 As this lens carries Sony's 'G' moniker, it is one of their premium lenses, even so, the price seems quite reasonable, at around £450. Could this be too good to be true? We'll investigate in this review. Build and design is typical of Sony's premium E-Mount lenses, with a robust aluminium outer lens barrel and a metal lens mount. 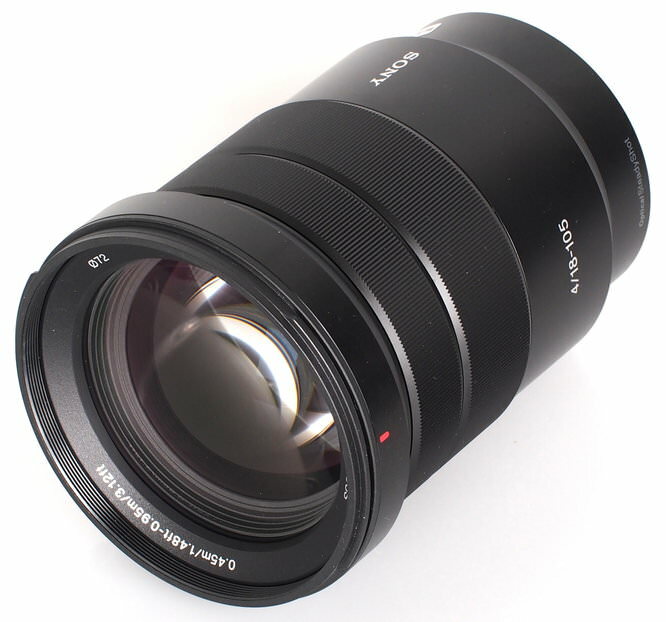 Despite the large size of this lens, it is reasonably light weight, weighing only 427g, . Even with the large size of the lens, the low weight ensures the lens will match up perfectly with even the most compact NEX series camera bodies, and it handles very well on the NEX-7 used for testing. Auto focus is reasonably fast locking onto subjects accurately. Applying manual focus adjustments is a pleasure, thanks to the smooth action of the focusing ring, which is nicely damped. Minimum focus varies throughout the zoom range, being 45cm at 18mm and 95cm at 105mm. As focusing and zooming are performed internally, the 72mm filter ring does not rotate, which makes the lens ideal for use with graduated and polarising filters. A deep petal-shaped lens hood is supplied as standard, which attaches to the lens via a bayonet fitting. The lens seems geared more towards video than stills, with a camcorder style tele/wide zoom control accompanying a zoom ring that can be rotated. There is a slight delay in operation with either control, although zooming can be performed very smoothly, which will suit video very well. There is a noticeable delay when switching on the camera with this lens attached, as the lens prepares itself for use and resets the zoom to 18mm each time. For those times when slow shutter speeds are necessary, this lens comes equipped with optical image stabilisation. With care, sharp hand-held images can be taken at shutter speeds as slow as 1/20sec, which is roughly three stops slower than the usual rule of thumb for hand-held photography would allow. Sharpness is already excellent in the centre of the frame at maximum aperture and 18mm, with very good clarity being recorded towards the edges of the frame. Stopping down improves performance across the frame, with peak clarity being achieved at f/5.6. Here sharpness is outstanding in the centre and excellent towards the edges of the frame. 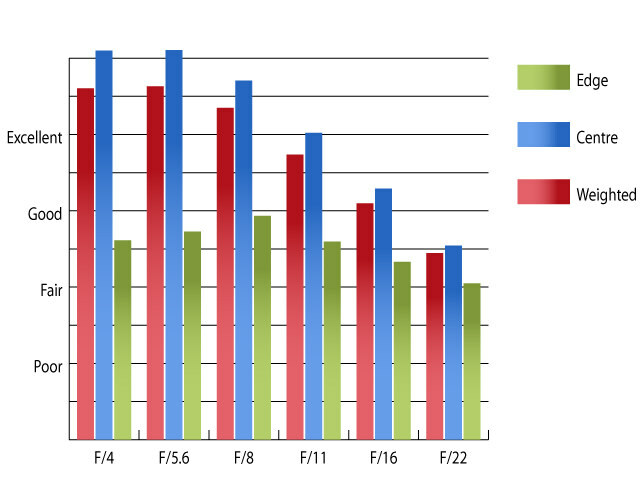 Zooming to 45mm results in improved performance at maximum aperture. Here sharpness in the centre is outstanding and clarity towards the edges of the frame is very good. 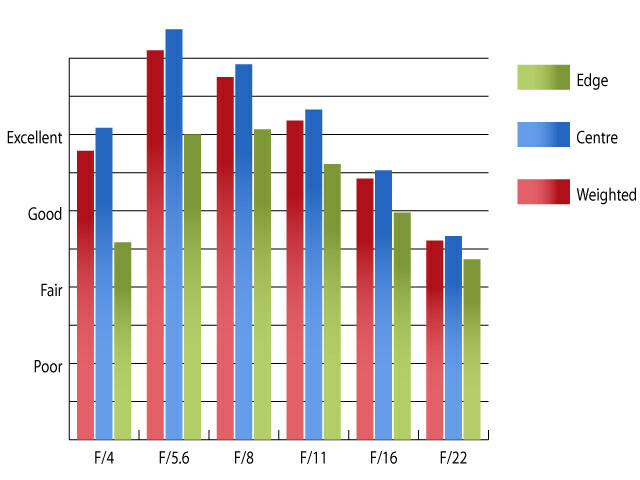 Stopping down to f/5.6 results in peak performance across the frame. Here sharpness is outstanding in the centre of the frame, and excellent towards the edges of the frame. Finally, at 105mm, performance in the centre of the frame remains outstanding, although sharpness towards the edges of the frame appears to fall off a cliff, only achieving fairly good levels. Stopping down to f/8 results in the best performance, with outstanding sharpness in the centre and clarity that falls just short of good levels towards the edges of the frame. 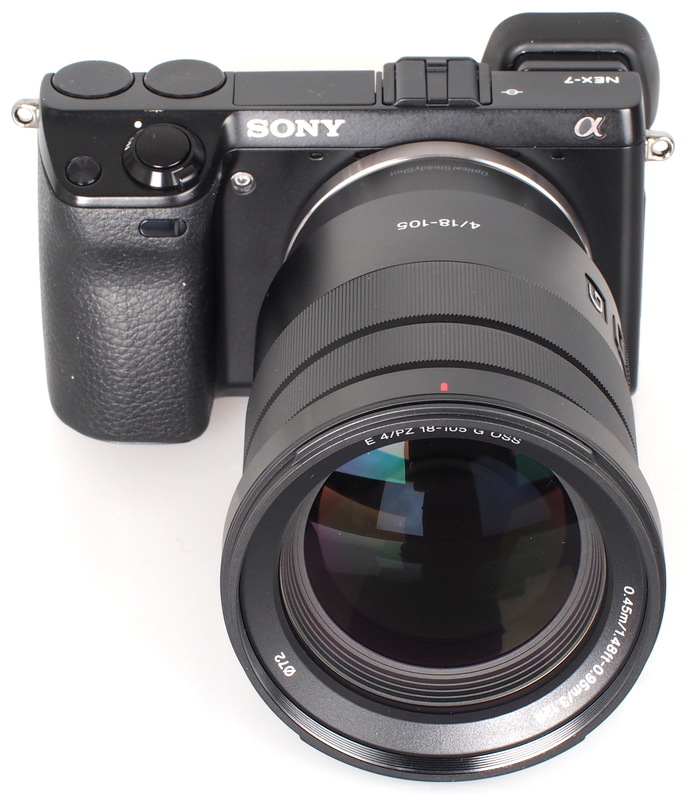 For this review, the lens was tested on a Sony NEX-7 using Imatest. Chromatic aberrations are prevalent towards the edges of the frame, regularly exceeding 1 pixel width and even 2 pixel widths at 105mm. This level of fringing may become visible along high contrast edges placed near the edges of the frame. Falloff of illumination towards the corners of the frame is well controlled. At 18mm the corners of the frame are 0.98 stops darker than the image centre at f/4 and at 105mm the corners are 0.91 stops darker. 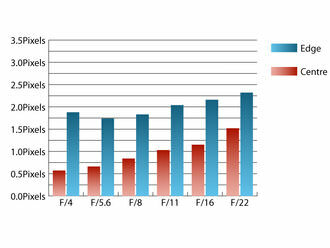 Visually uniform illumination is achieved with the lens stopped down to f/5.6 or beyond throughout the zoom range. The distortion this lens produces is quite noticeable. At 18mm 0.495% pincushion distortion is present, which is replaced with 7.2% pincushion distortion at 105mm. The NEX 7 used for testing automatically corrects JPEG images once they are taken, which results in the image jumping about wildly on the screen as the corrections are applied. As the correction applied is effectively stretching the centre of the frame, this will result in reduced resolution in JPEG images. RAW images are left uncorrected. The supplied lens hood does an excellent job of shielding the lens from extraneous light that may cause issues with flare. Even without the hood this lens is quite resistant to flare and retains contrast well when shooting into the light. As the distortion of the lens is very noticeable when shooting RAW images, we have included examples showing the JPEG images corrected in-camera, as well as in Adobe Photoshop below - using Adobe Photoshop CS6 and Camera Raw 8.4 beta. For those that shoot JPEG only, you are unlikely to see the distortion at the telephoto end of the lens. This lens can be picked up for around £450, which seems quite good value for money, given the specification of this lens. There are no direct alternatives covering the same range, with the same aperture at the moment. The closest is probably the Sony 18-200mm f/3.5-6.3 OSS LE lens, which gains at the telephoto end and costs £550. Clearly, as this lens is aimed at video shooters, some of the optical issues may not be a concern for people recording moving images with this lens on an NEX camera. In fact, it is very good for this job. Those shooting stills may be wary of the poor performance towards the edges of the frame at the telephoto end of the zoom, and the wild distortion that is present, as well as the high levels of fringing present. These issues make the lens difficult to recommend to those who may shoot stills with this lens, unless shooting JPEG only. The High distortion that Gary states is well shown in the 2nd pic of the 2 men in front of the building, zoomed to 105mm. However, Gary does not say whether or not the LENS COMPENSATION option in the Settings of the NEX-7 is turned ON or OFF. I saw another review of this lens and the reviewer stated that this distortion is corrected when that option is turned on. By the look of the distortion I may guess Gary did not turn on LENS COMPENSATION in the menu of the NEX-7, but then again if he did, this lens has a serious issue with distortion. Gary can you please verify whether or not Lens Compensation was turned on or off? I sent him a Private Message too, so I hope to hear back from him soon. I want this lens so bad on my a6000 (when I get it). But with that type of distortion, I'm scared to buy one until I hear back from Gary. I think it may have been on, but maybe not in that picture he took. Maybe he was showing us the Uncorrected image. In the review he states: "The NEX 7 used for testing automatically corrects JPEG images once they are taken, which results in the image jumping about wildly on the screen as the corrections are applied. As the correction applied is effectively stretching the centre of the frame, this will result in greatly reduced resolution in JPEG images." But Gary doesn't say whether or not LENS COMPENSATION is ON or OFF n that pic at 105mm. "The NEX 7 used for testing automatically corrects JPEG images once they are taken, which results in the image jumping about wildly on the screen as the corrections are applied. As the correction applied is effectively stretching the centre of the frame, this will result in greatly reduced resolution in JPEG images." But Gary doesn't say whether or not LENS COMPENSATION is ON or OFF n that pic at 105mm. Hi, it's most likely Gary will reply tomorrow as he is probably working tonight shooting a gig. This is the first real review of this lens I have seen (and thank you:) and from anecdotal accounts there are no real surprises here. It is likely that I will get an a6000 specifically to use this lens for stills, regardless of the unfortunate zoom-by-wire or excessive geometric distortion. 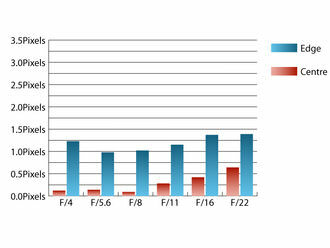 An Adobe lens profile has existed for a while now for ACR and Lightroom. I have no idea how effective it is however. Some of these profiles seem to be excellent... some not so good. And whether the ACR profile is accurate or not, I will use the standalone/filter PTLens software for critical geometric distortion correction even if I have to send in samples to Tom Niemann/epaperpress myself. This software is easy to use and superb. FWIW There is no way that the nasty 105mm example was corrected already. It 'un-Warps' nicely in PS which surprised me somewhat given the complexity of the distortion. Even with my crude manipulations, there was plenty of resolution present. Nitpicking, the biggest issue was the excessive sharpening that was present (which was fine given its purpose as a resolution sample). This is the first real review of this lens I have seen (and thank you and from anecdotal accounts there are no real surprises here. It is likely that I will get an a6000 specifically to use this lens for stills, regardless of the unfortunate zoom-by-wire or excessive geometric distortion. An Adobe lens profile has existed for a while now for ACR and Lightroom. I have no idea how effective it is however. Some of these profiles seem to be excellent... some not so good. And whether the ACR profile is accurate or not, I will use the standalone/filter PTLens software for critical geometric distortion correction even if I have to send in samples to Tom Niemann/epaperpress myself. This software is easy to use and superb. FWIW There is no way that the nasty 105mm example was corrected already. It 'un-Warps' nicely in PS which surprised me somewhat given the complexity of the distortion. Even with my crude manipulations, there was plenty of resolution present. Nitpicking, the biggest issue was the excessive sharpening that was present (which was fine given its purpose as a resolution sample). Lens correction was ON, but it doesn't apply to the RAW files, which are used for testing. The image jumps around something chronic in the viewfinder as the correction is applied. As I said [quote]The NEX 7 used for testing automatically corrects JPEG images once they are taken, which results in the image jumping about wildly on the screen as the corrections are applied. As the correction applied is effectively stretching the centre of the frame, this will result in greatly reduced resolution in JPEG images. [/quote] With the camera having to apply such a lot of correction, resolution will be reduced in the centre fo the image, as this will be stretched to compensate. It's also no use if you shoot RAW where you will either have to correct manually, or apply a pre-existing lens profile. Lens correction was ON, but it doesn't apply to the RAW files, which are used for testing. The image jumps around something chronic in the viewfinder as the correction is applied. Quote:The NEX 7 used for testing automatically corrects JPEG images once they are taken, which results in the image jumping about wildly on the screen as the corrections are applied. As the correction applied is effectively stretching the centre of the frame, this will result in greatly reduced resolution in JPEG images. With the camera having to apply such a lot of correction, resolution will be reduced in the centre fo the image, as this will be stretched to compensate. It's also no use if you shoot RAW where you will either have to correct manually, or apply a pre-existing lens profile. I just don't understand how Sony can make a lens like this and have that much distortion at the long end? It doesn't make sense. The Carl Zeiss 16-70mm E mount Lens doesn't have ANY or hardly any distortion at 70mm. Ja it is not 105mm zoom but still. It's almost like, let's make a crappy lens and charge $600 for it. Then it's up to the users to fix what we couldn't develop. Quote from Gary: "[b]The distortion this lens produces is like nothing else I have ever seen. [/b] At 18mm 0.495% pincushion distortion is present, which is replaced with 7.2% pincushion distortion at 105mm" Really? Okay. Whatever Sony. Thanks for a underdeveloped lens. 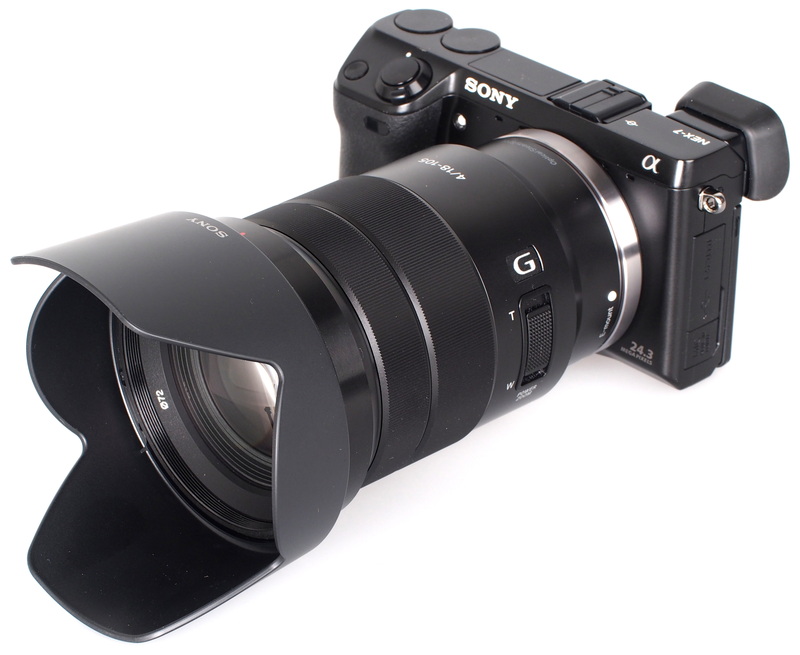 I just don't understand how Sony can make a lens like this and have that much distortion at the long end? It doesn't make sense. The Carl Zeiss 16-70mm E mount Lens doesn't have ANY or hardly any distortion at 70mm. Ja it is not 105mm zoom but still. It's almost like, let's make a crappy lens and charge $600 for it. Then it's up to the users to fix what we couldn't develop. Quote from Gary: "The distortion this lens produces is like nothing else I have ever seen. At 18mm 0.495% pincushion distortion is present, which is replaced with 7.2% pincushion distortion at 105mm"
Really? Okay. Whatever Sony. Thanks for a underdeveloped lens. I won't argue that this distortion isn't excessive because even my 14mm Samyang seems modest in comparison and that is the wildest I've ever seen but I would like to know what the practical 'real-world' ramifications are. Not that the correction needs to be done...but how much visible loss is involved with a high quality conversion. In my mind that is the only thing that matters. We have included JPEG examples showing the corrected JPEG from the camera, and another JPEG corrected in Photoshop. [quote]We have included JPEG examples showing the corrected JPEG from the camera, and another JPEG corrected in Photoshop. [/quote] That is great! Thanks for posting. Can anyone tell me with the JPEG images corrected "in Camera" if it slows down the Bust speed from 11fps? Quote:We have included JPEG examples showing the corrected JPEG from the camera, and another JPEG corrected in Photoshop. That is great! Thanks for posting. Can anyone tell me with the JPEG images corrected "in Camera" if it slows down the Bust speed from 11fps? OMG, that is MASSIVE amounts of LOSS in the "in camera" corrected JPEG. Night and day difference! Cannot even make out the smaller letters on the clock face on the "in camera" corrected JPEG. So looks like hand processing of JPEGS in PhotoShop is the way to go. What filter did you use or apply to correct the image in PhotoShop? Thanks. OMG, that is MASSIVE amounts of LOSS in the "in camera" corrected JPEG. Night and day difference! Cannot even make out the smaller letters on the clock face on the "in camera" corrected JPEG. So looks like hand processing of JPEGS in PhotoShop is the way to go. What filter did you use or apply to correct the image in PhotoShop? Hi RazorV the in-camera JPEG is taken from the RAW file which is a reduced size image (1606x1080), the image converted from RAW to JPEG in Adobe Photoshop is a full size image. Its unfortunate that we can't see the Out-Of-Camera Jpeg correction at a full 24MP but a full 6000x4000 OOC Jpeg probably doesn't exist (and never did in this test). I'm encouraged that the 'from-RAW ACR-PS Jpeg' maintains excellent sharpness and can even be tweaked a bit more. I can see that the CA seems to be missing in the small OOC Jpeg, whereas its quite nasty in the 'from-RAW ACR-PS Jpeg'. I have to assume that in the ACR 'Lens Correction' tab... 'Remove Chromatic Aberration' was NOT checked. I'll be very upset if this is the best ACR can do with this lens' CA. What I found especially interesting is the discrepancy between OOC Jpeg geometric distortion correction and the ACR correction using the Adobe lens profile. I copied both corrected images to PS and resampled the small OOC Jpeg up to 24MP. I then used the ruler tool to straighten both images using the endpoints from one of the grooves in the brown stone and then drew a light blue line across in both samples using the same endpoints. I cut out a small section of the enlarged OOC Jpeg, offset it on the 'from-RAW ACR-PS Jpeg' image and cropped the entire image to fit on a 1080P screen. FWIW the section that was copied over did not exactly match the size of the ACR RAW conversion. Not surprising, since they distort/correct the two images differently. I cheated and resized it a tad to be easier to perceive the true offset of the blue reference lines. http://www.pbase.com/misterpixel/image/154652117 As you can see (or hope you can see), the (lower resolution) OOC insert w/ red border shows that the OOC corrected image is still distorted twice as much as the 'ACR lens profile' corrected version. Personally I bet that PTLens will eventually do even better but, whatever, the camera does an acceptable job and ACR does even better while maintaining sharpness. Its unfortunate that we can't see the Out-Of-Camera Jpeg correction at a full 24MP but a full 6000x4000 OOC Jpeg probably doesn't exist (and never did in this test). I'm encouraged that the 'from-RAW ACR-PS Jpeg' maintains excellent sharpness and can even be tweaked a bit more. I can see that the CA seems to be missing in the small OOC Jpeg, whereas its quite nasty in the 'from-RAW ACR-PS Jpeg'. I have to assume that in the ACR 'Lens Correction' tab... 'Remove Chromatic Aberration' was NOT checked. I'll be very upset if this is the best ACR can do with this lens' CA. What I found especially interesting is the discrepancy between OOC Jpeg geometric distortion correction and the ACR correction using the Adobe lens profile. I copied both corrected images to PS and resampled the small OOC Jpeg up to 24MP. I then used the ruler tool to straighten both images using the endpoints from one of the grooves in the brown stone and then drew a light blue line across in both samples using the same endpoints. I cut out a small section of the enlarged OOC Jpeg, offset it on the 'from-RAW ACR-PS Jpeg' image and cropped the entire image to fit on a 1080P screen. 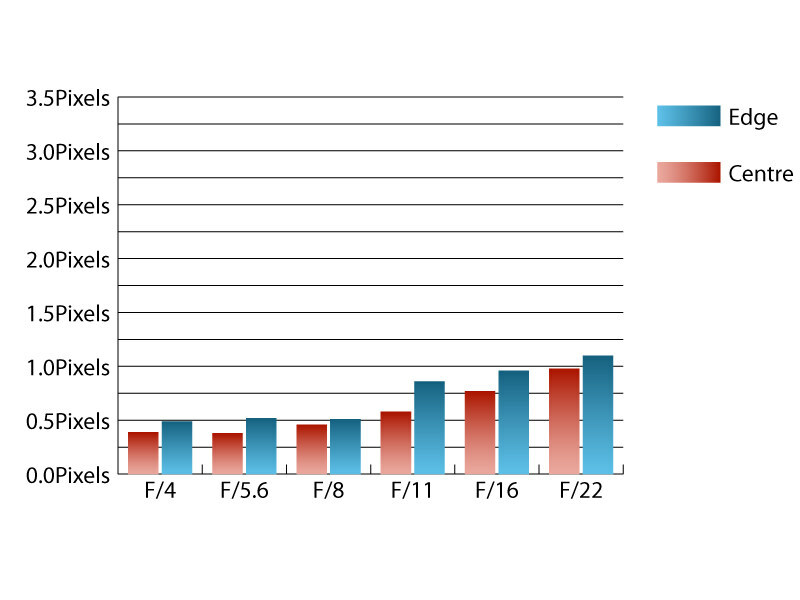 FWIW the section that was copied over did not exactly match the size of the ACR RAW conversion. Not surprising, since they distort/correct the two images differently. I cheated and resized it a tad to be easier to perceive the true offset of the blue reference lines. As you can see (or hope you can see), the (lower resolution) OOC insert w/ red border shows that the OOC corrected image is still distorted twice as much as the 'ACR lens profile' corrected version. Personally I bet that PTLens will eventually do even better but, whatever, the camera does an acceptable job and ACR does even better while maintaining sharpness. Hi Bruceo, we've uploaded a version corrected with Adobe Photoshop CS6 / Adobe Camera Raw 8.4beta. Hope this helps, thanks Josh. Thanks for the new reference image from ACR 8.4 beta. I am having some difficulty interpreting my results. I have to presume that Adobe Camera Raw 8.4 beta comes with an updated Sony 18-105 G lens profile OR the rendering engine in the new ACR treats that profile differently. Whatever...it appears to now ever so slightly OVER-correct the image. We are using an edge from architecture where its impossible to know how linearly true the actual building is. I would consider your original ACR example as more than acceptable for all but architectural studies and the new 8.4 beta is even more accurate (if slightly overcorrected). The amount off is little more than the head of the white flat-head mounting bolt on the clock! This is actually quite impressive to me. 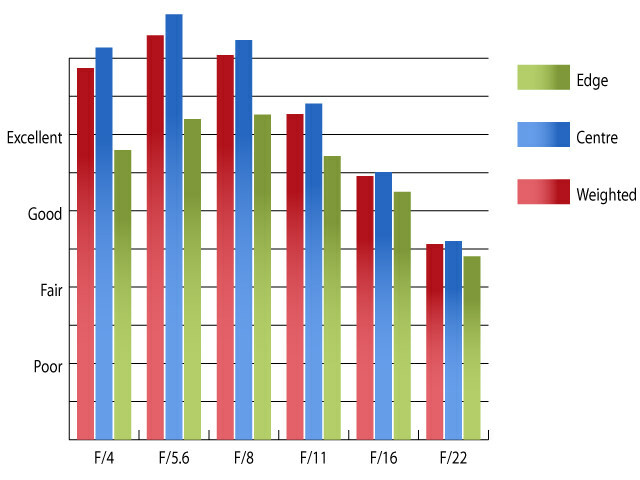 http://www.pbase.com/image/154652117 There is a fairly significant shift in the two RAW conversion corrections. I did a 'difference' blending mode comparison in PS CS5 and even casual alignment was impossible. And speaking of the shift, originally I tried aligning the OOC Jpeg and RAW image via the image itself and then realized I was on a fool's mission and realigned everything to the imaginary 'blue' level line that shows the amount of 'barrel' distortion above the clock. In the latest iteration of my example where the blue line is level, the red bordered insert is the up-resed original OOC Jpeg correction, the background is the original corrected from RAW version and the yellow bordered insert is the latest version corrected from RAW- ACR8.4 beta. I've also have incorporated a white bordered insert which is a downscaled version of the entire image...more for people stumbling on this while surfing the Web. ...and the CA is gone in this latest RAW conversion:) More and more, I like this lens for a walkabout solution. Thanks for the new reference image from ACR 8.4 beta. I am having some difficulty interpreting my results. I have to presume that Adobe Camera Raw 8.4 beta comes with an updated Sony 18-105 G lens profile OR the rendering engine in the new ACR treats that profile differently. Whatever...it appears to now ever so slightly OVER-correct the image. We are using an edge from architecture where its impossible to know how linearly true the actual building is. I would consider your original ACR example as more than acceptable for all but architectural studies and the new 8.4 beta is even more accurate (if slightly overcorrected). The amount off is little more than the head of the white flat-head mounting bolt on the clock! This is actually quite impressive to me. 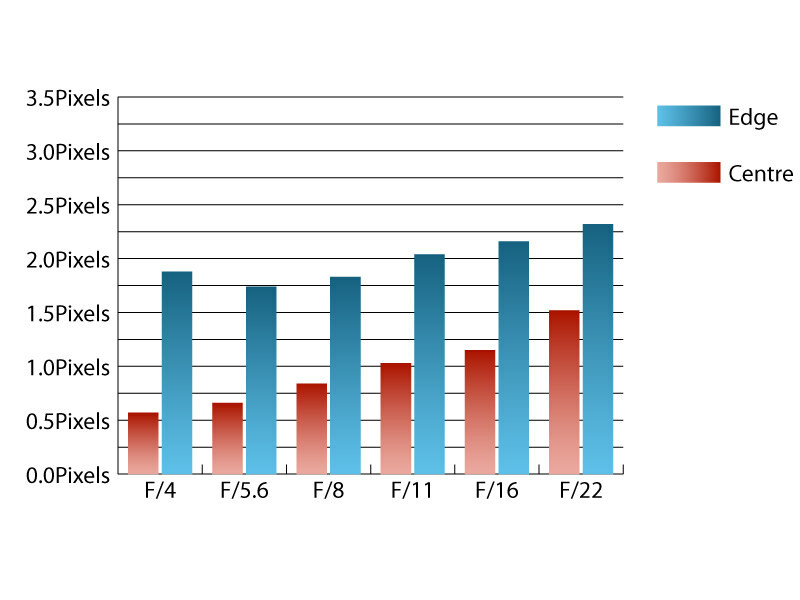 There is a fairly significant shift in the two RAW conversion corrections. I did a 'difference' blending mode comparison in PS CS5 and even casual alignment was impossible. And speaking of the shift, originally I tried aligning the OOC Jpeg and RAW image via the image itself and then realized I was on a fool's mission and realigned everything to the imaginary 'blue' level line that shows the amount of 'barrel' distortion above the clock. In the latest iteration of my example where the blue line is level, the red bordered insert is the up-resed original OOC Jpeg correction, the background is the original corrected from RAW version and the yellow bordered insert is the latest version corrected from RAW- ACR8.4 beta. I've also have incorporated a white bordered insert which is a downscaled version of the entire image...more for people stumbling on this while surfing the Web. More and more, I like this lens for a walkabout solution. So, pillow distortion correction is no problem with the jpegs in a nex camera, or post correction with raw. This is the situation for stills. But how about shooting video with a nex 6 or a6000? This lens is also aimed at video users. Is there a correction build into the nex cameras when shooting in the avchd format? If not, this lense is useless for video? So, pillow distortion correction is no problem with the jpegs in a nex camera, or post correction with raw. This is the situation for stills. But how about shooting video with a nex 6 or a6000? This lens is also aimed at video users. Is there a correction build into the nex cameras when shooting in the avchd format? If not, this lense is useless for video?